This farm has been in the Moore family for nearly a century. Jim Moore began working the farm twenty-five years ago while he was in high school and purchased it from his grandmother in 1985. Today, Moore Family Farm is under the care of Jim, his wife, Diann, and their two sons, Wes (17) and Aaron (15). The farms 100 acres are comprised of 60 acres of tillable land and 40 acres of timber. Between 15-18 acres are dedicated to vegetable and fruit production, and the Moores also produce a myriad of meat and poultry products. The assortment includes grass-fed beef, lamb, and pasture-raised Tamworth pork. On the poultry side there are chickens (for both meat and eggs), turkeys, Holiday pasture-raised Bourbon Red Turkeys, and, uniquely, 100 ducks for eggs. No animals are raised in conventional confinement. Even as teenagers, Wes and Aaron are an invaluable part of the farming operation, and both plan to continue on the farm as adults. Their responsibilities include daily care for all the animals, working in the garden and at farmers markets, and making CSA deliveries. The Moores hire no help outside their own family. They believe that they cannot hire the same level of care, hard work, and commitment that they have as a family working together to maintain their own farm. Though we cant forget the familys three pugsMax, A.J. and Bess. In the mid-1980s, the Moores began the transition from conventional agricultural practices to ones that are friendly to people, animals and the environment. Moore Family Farm is currently not certified organic, but everything on the farm is produced and raised naturally, without pesticides, antibiotics, or growth hormones. 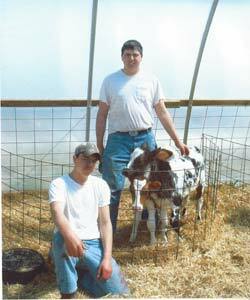 The Moores were featured in a May 12, 2005 USA Today article about CSA Farms. Click here to read Support from city folk takes root on the farm. Why is growing organic a priority for your family? Knowing how and where your food is grown or produced. Genuine concern for the land and environment. Enhancing nature, not destroying it. A dramatic difference in quality and flavor of the food produced. Our priority is regenerating health and vitality to the soil. Healthier food means healthier people. What is your favorite part of being an organic farmer? Watching the miracle of life unfold before your eyes, and the deep satisfaction of knowing that all life is interconnected. Seeing results of your labor develop into an abundant harvest. Being appreciated by your customers, knowing that you have helped someone who cares about the whole picture. Being viewed as a lunatic or an eccentric, finding cultural and pre-industrial farming and livestock information, staying ahead of the weeds, damaging weatherfloods, droughts, storms, early freezecrop failures, cold fingers and aching body parts. Why should people buy organic products instead of other options? Connecting directly with your food supply, directly supporting farmers who are being good environmental stewards, obvious health choiceno-cides. The consumer has the choice to vote with their food dollars. We are uniquea small family-owned and operated farm. Biodiversifiedopenfield, pasture, woodland and wildlife integrated into the landscape with the diversity of crops and livestock. We work toward being as self-sufficient as our forefathers. A farm for families to feel safe knowing where, how, and by whom their food is produced. Where would you like your business to be next year? In the next 5 years? 10? In the next five years we would like to see our farm expand its market area to provide a secure job future for our two sonsso they can continue being good stewards. In ten years well be watching our family grow and knowing that when they are on the farm they are in a safe and healthy environment. That when they something direct from the garden or tree, it is the best we have. We hope to have a secure customer base to support ourselves and our two sons. Where can consumers get your products? We sell our produce through the Prairieland CSA of Champaign, IL; visit the website for details. Products are also available at food coops and bacaro restaurant in Champaign, IL. For more information on Moore Family Farm, contact the Moores at (815) 432-6238.